In order for Bio-degradable waste to be good for the environment, we as consumers need to take the initiative to create compost piles in our backyards. Compost piles (where biodegradable waste is thrown into a hole in the ground and then broken down by worms and other natural organisms) return the nutrients in bio-degradable materials to the earth. Why do I care? Composting bio-degradable garbage (banana peels, apple cores and other food garbage in addition to bio-degradable packaging) is the best way to keep earth cleaning by letting nature break down waste. It also reduces land-fill sizes, leaving more room for parks and neighborhoods. Please see this helpful page at Earth Easy for details on how to get started! An alternative to bio-degradable packaging that will help save the earth is re-usable packaging made from cloth. One World Projects sells small draw-string bags that can be used to hold purchased products at the bottom of This Page. 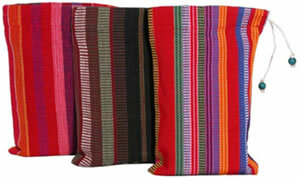 The bags are made out of re-used fabric from the traditional garb of Guatemalan women.